Network your devices anywhere on the globe. The MCG-101 is a mounted satellite terminal that contains an Iridium satellite modem to provide voice and data services to multiple connected devices, such as: traditional analog or SIP phones, smartphones, tablets, computers, and laptops. The terminal contains an internal SIM card that must be installed properly for the system to function normally. The MCG-101 also has an exposed SMA connector for attaching the required external antenna, which is procured separately in order to accommodate your specific needs, as the device is hardware agnostic. The status of the entire system can be monitored through a connected computer or through an optional DPL handset. 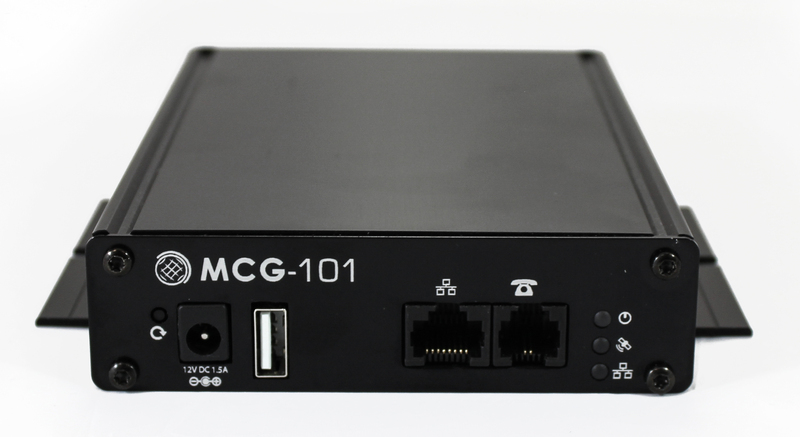 The MCG-101 can enable a number of telecommunications capabilities in remote locations, and can also provide redundant or backup systems for emergency or disaster scenarios when traditional infrastructure becomes unavailable, unreliable, or fails completely. The terminal can support communications within a team, and can also allow users the ability to communicate with anyone via voice or data (in many forms, including SMS). There are two primary use scenarios under which most use cases fall: Mounted Stationary Solutions and Mounted Mobile Solutions. The device functions similarly in each scenario, but caters to vastly different needs, and has different setup requirements. Mounted Stationary Solutions typically serve to outfit a command station of some kind, like a Fire Station (as in our example below), and Mounted Mobile Solutions will allow for looped communication in the field (as with our wildfire example below). In remote parts of the United States, wildfires can be a common occurrence that require coordinated efforts to fight, such as that which started at Chimney Tops Campground in The Great Smoky Mountains National Park during November of 2016. Gatlinburg’s communications systems were knocked out near the beginning of the evacuation effort, leaving the alert system suspended, and the overall evacuation effort in a state of disarray. In addition, as coordination of firefighting and manual evacuation notices began to involve other departments as well as state and national resources, the communications breakdown greatly exacerbated the problems. In a scenario such as this one, having fully equipped fire stations and ranger stations would have prevented a number of wasted manual efforts to evacuate, and likely could have even resulted in a number of lives and/or structures being saved. A fire station or ranger station equipped with MCG-101 technology would have continued to have access to phone service, as well as the ability to send and receive data from other departments and relief support agencies like the national guard, Knoxville FD, State Police, and local news organizations. Having their fleet vehicles equipped with this technology would also have allowed for better relief efforts, as each vehicle could have communicated with central operations command with regard to progress, requests for additional support, special evacuation requests (helicopter transport or medevac), and “all clear” reporting. The value of this level of communication in scenarios such as these is immeasurable, as it can often include lives saved, historic locations or protected areas preserved, and other infrastructure like roadways and bridges remaining operative. Additionally, if command posts and vehicles or vessels are all outfitted with the required antenna equipment, a single MCG-101 can become a portable solution as well, allowing you to dismount your stationary setup from your command post and maintain communications in a vehicle or convoy if necessary. 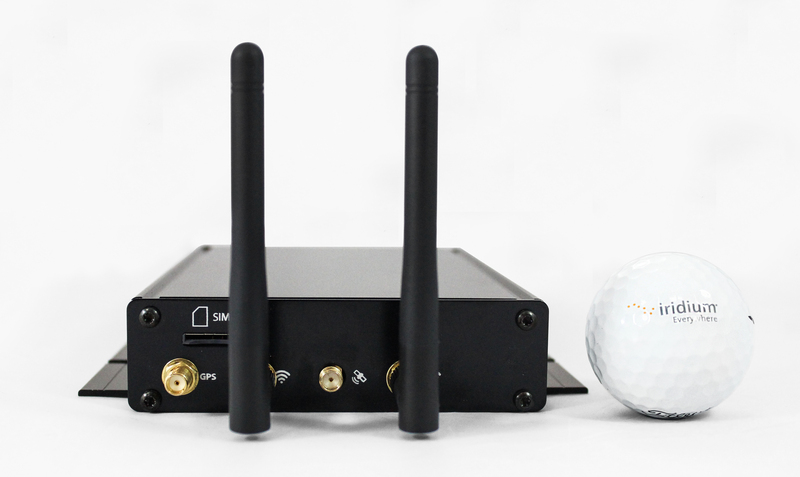 Feature Functionality for the MCG-101 is extensive, and includes all forms of communications transmission and receiving, enabled by a number of different connection types. 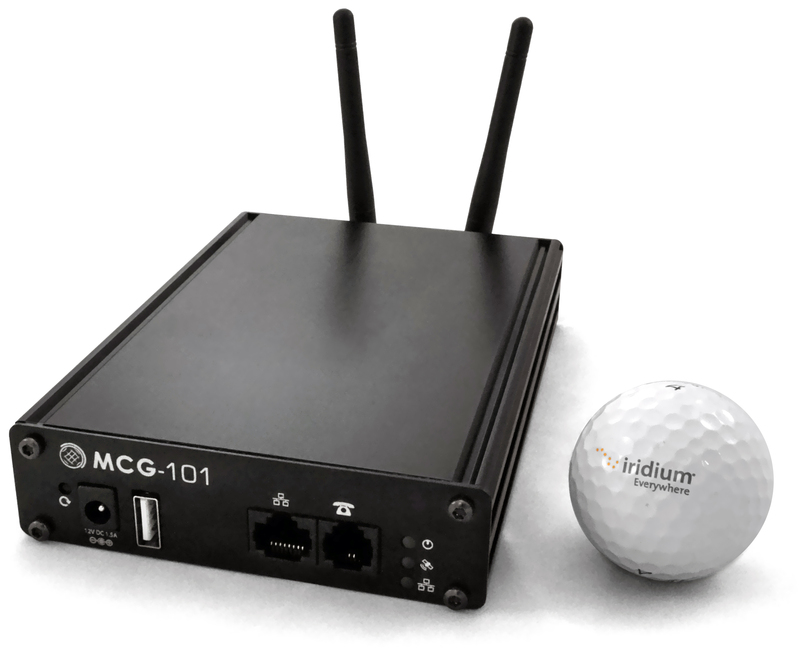 You can connect any standard analog telephone directly to the MCG-101 and start using the Iridium network. All of your calls are digitally processed for the best quality. For all satellite telephony products, we recommend the use of SatCollect to reduce costs and operate with a local phone number. 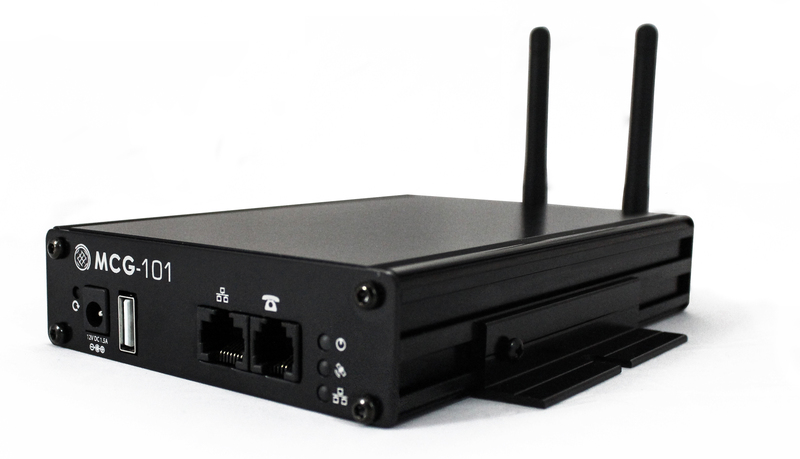 The MCG-101 contains an embedded GPS receiver for GPS tracking, with 20 channels, -159dbm sensitivity, and a 2 meter accuracy. Best of all, the GPS receiver shares a single antenna with the Iridium modem, so installation is simple. Connecting your computer to the Internet is as simple as plugging it in. Just connect your computer and go online, and the MCG-101 will automatically connect to the Internet for you. 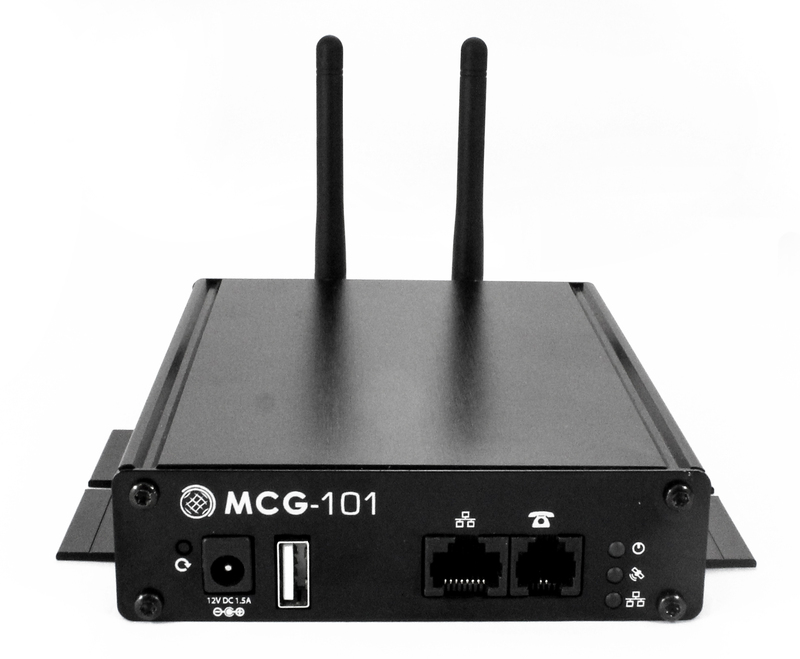 You can also configure the MCG-101 via the ethernet port. Connect via WiFi to enable phone calls directly from your mobile phone. USB port for expansion to connect external peripherals. The MCG-101 has an external SIM card slot which makes installing or changing the SIM card fast and simple. Connect any standard analog telephone or any SIP capable phone to the MCG-101 and you can start making phone calls. Digital audio processing gives you the best audio quality, and with Iridium, you can call from anywhere to anywhere in the world. 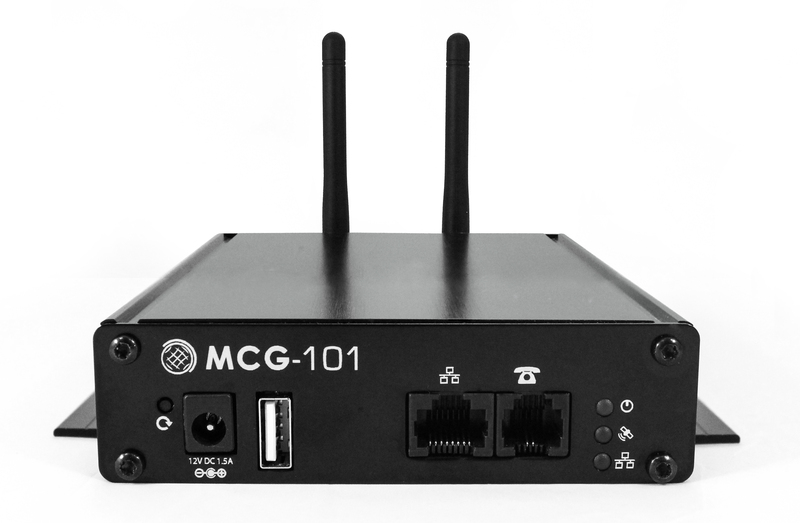 The MCG-101 is a fully capable processing platform that can be easily configured for custom call routing, data applications, and special projects. The system features a full PBX that can run an entire office, and run custom software as well. An SDK is available allowing you to develop your own solutions for complex projects. By using the MCG-101 as a standard platform, the development time is shortened, allowing you to deliver finished solutions to your customers fast. Iridium 9523: Human Body Model 2kV and Machine Model 200V ESD protection. GPS port: ESD sensitive port only when antenna not connected. 2x WiFi ports: ESD sensitive port only when antenna not connected.